This past Monday I ventured over to LogoPond.com, a website where designers post logo designs they have created for review or just to show off their latest work. After a short while of looking through pages of logos I instantly recognized an image as one that I created about six months ago. It turns out that a member of the site named Julie Kapral, AKA JulieK, a 16 year old "designer", decided that she was going to take credit for my work. And take credit she did. With seemingly jubilant excitement she thanked people for posting compliments for the illustration she claimed to have created. I posted in the thread and in the site forum that I was the real creator of the work. A rebuttal was quickly posted by JulieK stating that she did not steal the work. Then admitting she did not make the illustration but got it from a book and then implying that perhaps I did not create the illustration either and probably used the same source that she got it from. After promising to show a scan of the book she got the illustration from the next day she was not heard from again. I later went on to find other work on her site that was created by other artists. It's almost certain that every piece in her portfolio was plagiarized. 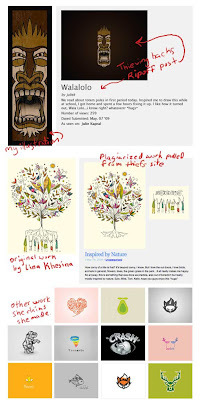 Her work has since been pulled from LogoPond.com and her personal website is no longer up on the web. The worst part of this is that She actually sold some logos on a website where pre-made logos can be purchased. These logos were most likely other designers work and were probably trademarked by the companies that are originally using the designs. That means that there are some companies out there that can potentially be sued for copyright infringement even if they did not know the work was plagiarized. Do I feel bad for calling out a 16 year old? Hell no I do not. I wonder if that's her real name, if she's really 16 or even a girl. I actually had Julie working on a project of mine when I found out that she had stolen others artwork. Immediately, I confronted her about it and she told me she had made some wrong choices in the past. Then, in the middle of my project, she vanished. Her email no longer works. She stole hundreds of dollars from me, personally. Marco Echevarria is a graphic designer and illustrator based in Carlisle, PA.